Since it is performed using a supinated or underhand grip, it places more emphasis on your forearms, biceps, triceps, and back muscles than other variations of lat pulldowns. While doing the exercise, the trapezius muscles compliment the shoulder muscles and help in improving stability in the lower back. It stimulates your lower latissimus dorsi and gives an appearance of thicker and fuller lats. Attach a wide-grip bar to the cable pulldown machine and then assume a sitting position. Make sure the knee pads are adjusted to a level that fits your height. 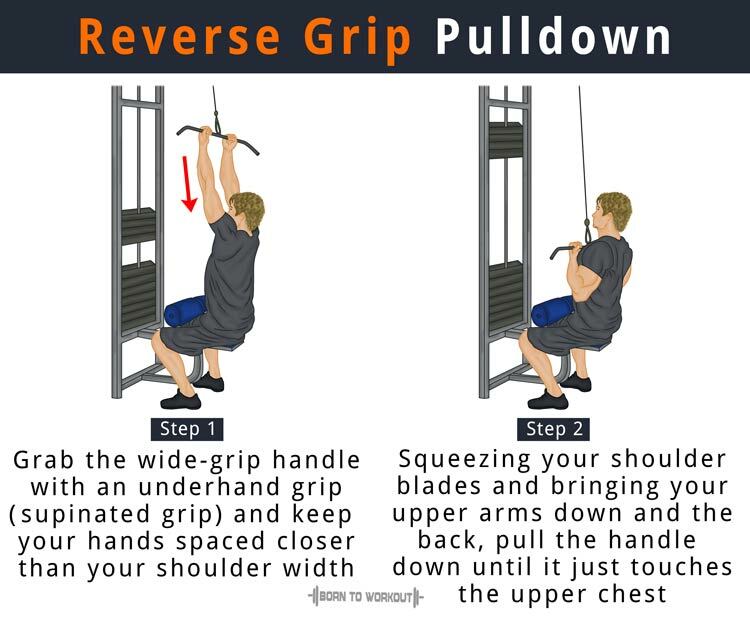 Placing your hands at a distance slightly closer than your shoulder width, hold the pulldown bar using a supinated or underhand grip so that the palms face your torso. While both your arms are extended in front, bring the torso back at an angle of 30 degrees thereby bending the lower back and protruding your chest out. It is the starting position. Draw your shoulders and upper arms down to pull the bar towards your body so that it touches the upper chest. Hold the contracted position for a second and gradually bring the bar to the initial position when your lats are stretched, and the arms are completely extended. Make sure that you squeeze your back muscles and keep your elbows close to the body once you achieve maximum contraction. Keep the upper torso stationary while bringing the bar towards your body, only allowing your arms to move. Use the forearms only for holding the bar throughout the movement.